The modern trader needs an all-rounder mentality, considerable flexibility and the power to be a decision maker. 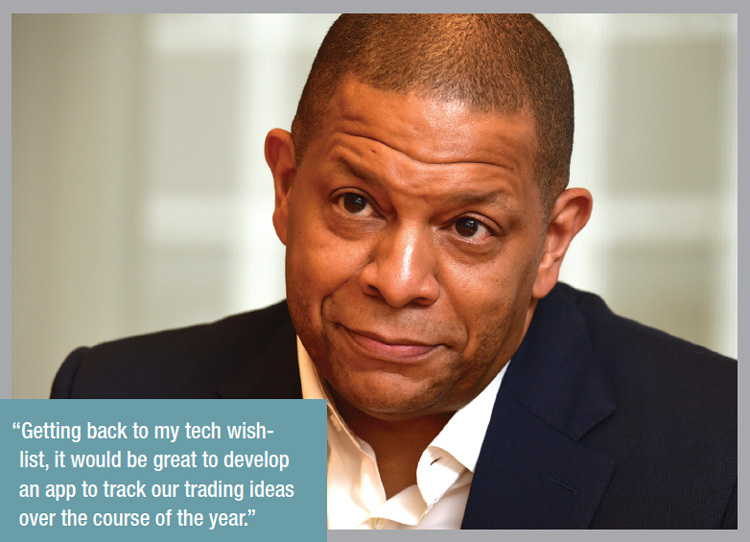 Dwayne Middleton is head of US fixed income trading at Morgan Stanley Investment Management (MSIM), since joining in 2009. 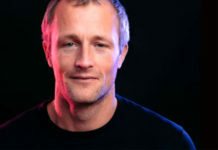 He handles trading for separately managed accounts and funds across instruments and leads sell-side interaction to represent MSIM clients’ interests. 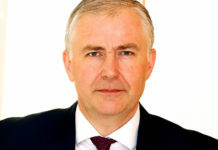 Prior to joining MSIM he had worked at JP Morgan Asset Management as head of US Investment Grade Credit Strategy and as a senior portfolio manager. He has a BA in economics from the University of Maryland. What changes do buy-side desks need to make and what assistance do they need? Dwayne Middleton: Everything falls back to being proactive and thoughtful around the risk in the markets. A connected desktop helps us perform our roles better. As traders, we need to determine which trading protocol helps us to achieve the best client outcome. The trading desk routinely has to play defence and offence throughout the course of a trading day. As members of the investment team, a key role we have is to provide market intelligence to meet portfolio managers’ investment directives. We share liquidity views with portfolio managers and research analysts to assist them in making their ideas impactful. 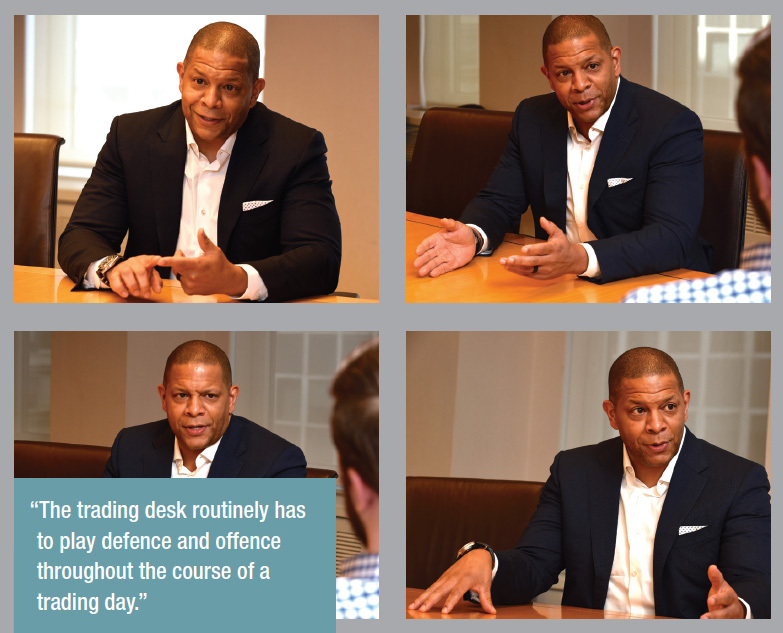 The desk plays a role in mitigating portfolio risk. We optimise trading protocols to reduce information leakage. Traders are often viewed as owners of the trade lifecycle, so we need to ensure that our operations and compliance teams are on the same page to make the workflow optimal. Interconnected applications help us with all of these daily functions. It’s imperative that a trader is viewed as a decision maker internally and externally to capture discrete liquidity opportunities that arise. When we are shown those opportunities, trading has to have the capability and tools to be proactive. Which of the new generation of platforms is actually impacting the market beyond the hype? Our mindset shifted to solving workflow bottlenecks and improving our insight on which protocols work best for given situations. The leading platforms, plus a few new entrants, gained more traction by understanding the underlying workflow issues and bringing efficiency solutions to the desktop. We have seen the expansion of all-to-all trading. We have benefited and improved our processes the most with platforms where dealers are involved as well. I’m encouraged by the increasing data science initiatives by a number of platforms. Vendors have developed pricing algos that frame a composite valuation that has been beneficial for pre-trade price discovery. We have captured full straight-through-processing from this pricing by trading lists of smaller notional size trades using constraints around these composite prices. These lists could be 50+ line items that historically have taken up a lot time on the buy-side trading desk. The growth of dealer pricing algos has also improved the process of sourcing executable levels on a wider range of bonds. Trade sizes less than US$2 million notional, for investment grade bonds, are priced by dealer algos more frequently. The elimination of inefficient processes is a game changer for the buy-side trading desk. As a team, we are dedicated to freeing up our time to focus on more value-added trades. The follow-on effect is leading to efficiency in other areas. We are in an exciting time for the fixed income market with the growing interest in, and usage of, macro portfolio trading products. These instruments comprised of exchange-traded funds (ETFs), total return swaps and credit default (CDS and CDX) swaps are vehicles to manage market exposure. The interconnection of the ETF ecosystem with the traditional market making business of the dealers has led to an efficient way for the buy side to transfer beta risk or even design specific alpha baskets of bonds through portfolio trading. This has presented opportunities for us to add value for clients by getting our targeted risk exposure in a defined time period with price visibility from different pools of liquidity. Are there any initiatives that the buy side should be pushing for? We are working towards an objective to have our desktop applications have a seamless integration. On the efficiency aspect, we are trying to remove a lot of the non-productive tasks that had fallen to trading over time. There is an open source initiative that is addressing these issues, the Fintech Open Source Foundation, FINOS.org. OpenFin, the operating system of finance, contributed the Connectivity and Collaboration Consortium, FDC3 to that initiative. We have a number of external apps running on the OpenFin OS. The growing adoption of this open source architecture by the broader fixed income community is a positive signal for making technology resources more efficient in use and cost. What is your perspective on the sell side’s journey of evolution? Fixed income trading remains a relationship driven engagement and each interaction we have is client focused. As a result, we value and work hard to nurture our dealer relationships. Dealers are actively partnering with us to find solutions to the complexities that are inherent in the fixed income market structure. Some examples are direct dealer FIX connections of inventory into our OMS with the goal to move to trade negotiation without having to leave the OMS to execute. The Neptune consortium is also an example of broader market participants working together. The reality is dealers play a very important role in terms of the transfer of liquidity, which is why a lot of volume is still heavily skewed towards dealer relationships to move risk. We are working to enhance our intelligence around our data and factor in a multitude of factors other than just our trading volumes. We want to show our key relationship partners how their wallet share is spread across our global fixed income business. That helps us present ourselves more holistically. How do you characterise the way that cost and risks of trading have been changing in your market? Bond valuations at the aggregate level have been largely range bound. There are idiosyncratic events that occur, so as an investment team we debate risk positions and re-underwrite the decision given new information. There is a justified focus on transaction costs and some industry participants are even contemplating outsourcing their trading effort. Being in my seat, the outsourcing concept is reflective of a benign market and not appreciating the complexity of the multi-asset environment. The value of a desk shines when you have fundamental as opposed to technical led volatility and we are able to proactively avoid risk or capture alpha. Of course we work hard to mute the impact of transaction costs on client portfolios. Our senior investors design an alpha strategy for a portfolio with an assessment of the implementation cost versus the relative value opportunity. Trading plays an active role by providing market insight into that design. The trading team is also focused on potential exit scenarios to help monetise ideas and is disciplined when that risk profile has changed. Liquidity today is different than in the pre-crisis world. As a whole, the transparency of pricing to buy-side investors has led to greater visibility than what was available pre-crisis. The buy-side trading professionals today are more skilled in decision making around price levels. Liquidity today is about the ability of the desk to source cheap opportunities and to be proactive on securities when a risk changes that runs counter to our positioning. There was so much leverage in the system pre-crisis and a smaller universe of cash bonds made up most of the volume that liquidity morphed into this on-demand concept. There were so many pathways to trade risk. The removal of the flexible risk capital buffers, whether it was the prop desks or hedge funds, post crisis changed the definition of liquidity. If someone holds onto that pre-crisis view of liquidity, they are missing the mark in my opinion. Liquidity should be measured differently today given turnover is lower resulting from the inventory transfer from the sell side to the client portfolio holdings of the buy side. What is your take on the evidencing of best execution? The objective of best execution is to get the best client outcome at a particular point in time. Best execution has to be viewed through a process lens. We explore options with vendors, dealers and internal technology colleagues to enrich the data that we have. This helps us provide market context for a given trade or a series of trades. Post-trade analysis has to be reviewed through the proper context. The evidence for our execution level for a given security is the range of prices of other trades and factors unique to our particular trade at that point in time. Making that happen is tough isn’t it? The challenges result from many bonds not having reference trade pricing every day or there might be a finite group of investors involved in a particular security, which limits the transactions that are visible. Some bonds are only traded by a few dealers. To obtain the best client outcome we have to develop an evidentiary process for the whole suite of securities that we trade in client portfolios. We have a best execution committee that meets quarterly. Trading is an active participant in helping colleagues that sit further away from the point of execution understand the pre-trade price discovery process, as well as the post-trade analysis. Do you think the need to evidence best execution changes the way traders view their jobs? Traders’ involvement in the investment process starts with an understanding of the client’s return objective. Therefore each engagement is client focused. A goal moving forward is to develop an automated solution around transaction data to do the evidentiary work for us, then the administrative aspects of sourcing evidence for best execution falls away. We have spent time sourcing quality data and the tools needed to extract that data. Our focus now is developing greater intelligence around our data and making the case for best execution easily understood by the casual observer. We have the ability in our OMS to aggregate axes and inventory from dealers and platforms, with real time indicative pricing. The next phase would be to take snapshots of that information and piece that back into supporting materials for best ex and TCA. How do the types of funds you execute orders for impact your trading profile? We trade the full fixed income universe and manage money for institutional clients. Our trading is very client focused, so our market engagement is solely focused on meeting client return objectives. Do you differentiate between high touch and low touch trading on the desk? The differentiation aligns with our efforts around efficiency and best client outcome. Electronic trading is a necessity for some products and for certain workflows to meet all the efficiency goals that we are trying to put in place. The concept of low touch trades fits nicely within an electronic solution. A low-touch example might be a client cash flow in which a portfolio manager builds orders consisting of a pro-rata portfolio slice that might total 100 line items. We will predetermine execution constraints encompassing the number of responses, a tolerance level around a composite price and a liquidity score. We have then solved for front-to-back, straight-through-processing which aligns with our drive for efficiency. For high touch trades, we want our trading desk involved in the discussion in determining the optimal path to achieve the best outcome for clients. Separating some of the maintenance workflow and redistributing that workflow to a more automated solution frees up time for us to work on value added ideas. 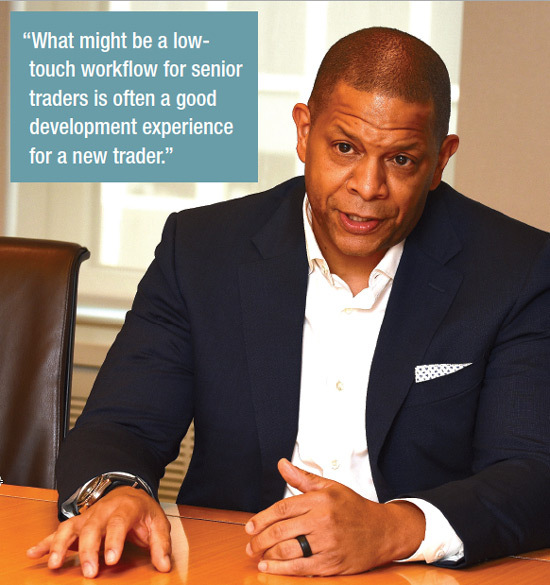 It’s a balance though; what might be a low touch workflow for senior traders is often a good development experience for a new trader. From a technology perspective which tools would you like to see developed, assuming that you had unlimited budgets and unlimited resources? Data has taken a lead in terms of focus within the fixed income space overall. The issue is not necessarily access to data but how to harness that data and make it useful to the investment team. We want applications and data feeds where we can extract information for use within the investment process. We are focusing our efforts on the data around the trade life cycle. The objective is to capture the pre and post trade data points and feed that into our analytics. There are hosts of follow-on uses from this data insight to best ex, best venues/dealers for a particular trade, security valuation, predictability of price moves. Connectivity is a key theme. We recently had a demo of an application which is potentially transformative for the workflow in one of our asset classes. Third party application integration with our OMS is a hurdle. Using the resources towards an integration effort is something I would advocate for. Is there the potential opportunity to use technologies like machine learning? AI and machine learning technology will help us gain insight into our data much faster. Tableau is doing some interesting things on this front. Our industry is highly regulated and there are time demands on human resources to sift through this avalanche of data. There are numerous repetitive processes around data analysis that are better suited for an AI or machine learning solution. For trading specifically pre-trade price discovery, market context, relative value insight are all areas where this technology can enable the desk to be better decision makers and faster in the deployment of ideas. Technology that combines artificial intelligence to enhance the human effort will be the most successful. Any tasks that can be put through AI/machine learning software, such as analysing spread/price history, are completed faster than what an individual trader can go through. That’s valuable for the desk. How is interaction within teams changing? Trading is growing in stature as a contributor to the alpha engine of the investment process. Traders need to be adaptable, thoughtful and proactive. People skills are important also. Over the course of a day, I’m interacting with portfolio managers, research analysts, compliance, operations, legal, and IT. Each interaction is from a different perspective. Traders need to be good communicators, even more so than in prior years. We have specialised trading roles which augment our trading capability in these multi-asset markets. We discuss ideas as a team with a focus on efficiency. Are we putting best practices into the workflow of all our teams and being consistent? How do you support idea generation? Idea generation is the pulse of an investment process. Trading is slotted in-between our investment process and the markets that we transact in, so we want an open exchange where opinions are valued equally and ideas can come from anywhere. Getting back to my tech wish-list, it would be great to develop an app to track our trading ideas over the course of the year. I see benefits for talent development and as a basis to demonstrate the desk contribution to alpha. Each trader has to be an advocate for their ideas with the goal of contributing to alpha. Through the combination of different styles and individual talents within the team, we are building towards a diversity of thought approach to achieve superior client outcomes. Do you think that candidates with quantitative skills are becoming more predominant when job opportunities arise on the trading desk? Bonds have always been a quantitative field and you definitely need a well-versed understanding of a quant approach to investing. I think flexibility is important. I’ve experienced markets where a pure quant approach has not delivered optimal results. We do have quantitative tools and models we use in our investment process. In terms of programming skills, I think that is growing if you observe how Python is being applied in trading workflows. While I am not a coder, I can still be active in the programming of applications. Traders are in the best position to map out the workflow issues we face to our internal technology team. We can then work with them to break down the issue into instructions and rules. Then the coders come in to translate those instructions and rules into code. So while I am not getting deep into the weeds in terms of the coding, I’m able to talk through concepts of an idea so they can understand what I am trying to frame out. Quantitative skills are valuable but so is being able to breakdown issues and strategising to move ideas forward.